I'm also a fan of Kojic soaps before. I've tried several brands like Kojie San, Japan Kojic Soap, Cyleina Kojic soap and others that I already forgot. I know this soap lightens the skin but you have to be patient enough to see the results. My sister-in-law joined this Royale Networking Business Club. 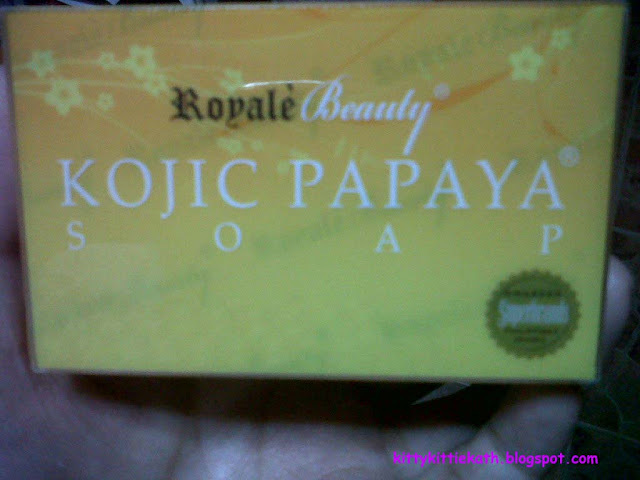 This Royale Kojic Papaya soap is one of their products. You can read everything about Royale Business Club here. Kojic Papaya Soap moisturizes and lightens the skin, has mild peeling effect. Wrapped in a plastic so it's all sealed. instructions for use: Use Kojic Papaya soap all over the body for bathing, lather well, rinse thoroughly and moisturize. I also use it on my face. ingredients: Coconut Oil, Palm Oil, Stearic Acid, Glycerine, Cocodiethanolamide, Water, Sodium hydroxide, Sodium lactate, Kojic Acid, Papaya Extract, Yellow Iron Oxide, Red Iron Oxide, Perfume. The soap doesn't melt easily. Says true to its mild peeling effect so I know it sloughs away dead skin. Keeps my skin moisturize and has a glow after use. The packaging is classy. Can be compared to the packaging of high end soaps like Metathione and Kyosoku Bihaku or KB soap. The batch, manufacturing and expiration date is printed on the packaging. Well sealed so you know it's fresh from the manufacturer. A bit pricey for a kojic papaya soap compared to other effective brands in the market. The scent reminds me of Perla detergent soap. May sting if the soaps lather is left for more than two minutes. It stings my eyes big time. I always make sure that the soap won't get in my eyes unlike other soaps that I can tolerate if accidentally get in my eyes. Will I repurchase: No, I love my All Organics Bath Soaps. If ever I want to try Kojic and Papaya soap again, there's a lot of brand to choose from. I give this soap a 3/5 rating. I'm a cheapskate so this is pricey for me. I don't find any special with this soap. I'm not sure if there's a lightening on my blemishes and dark spots because I only use this soap for a month. If you want to shell out more than a hundred bucks for a soap, you can try this. I think the only good with this soap is the mild peeling effect and the glow it gives after bathing. What Kojic Papaya soap have you tried?Have a happy weekend everyone! Never had a micro peeling like this in less than a week! Im using kojic and gluta every bath. Shows that it washes away the dead skin. Thumbs up! Good to know that it doesn't melt easily. I use Kojie-san and it is effective, but it melts fast! Will try this one. are u already tring royale kojic soap? what is the effect? 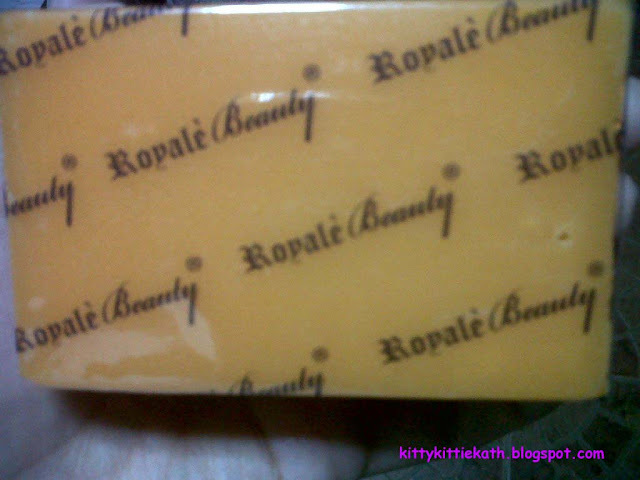 good am are you still using royale kojic soap? hello po miss maricar!im paul pasia from royale business club!if you want to try our product po just check my fb page https://www.facebook.com/paul.v.pasia and leave me a message or txt me @ 09152571988 ..
@Tintin- Thank you for visiting and sharing your insight about the product. The price for me is a bit expensive compared to the soaps that I've tried. I just based this on my personal experience and my own price range. Nonetheless, the soap is effective but there's also other kojic soap that worked for me in much cheaper price. Yeah, I do think that's a bit pricey for kojic soaps but not uncommon (a price) for a company that distributes product that way (is it an MLM type)? In any case, if it does indeed removes warts EFFECTIVELY and it is marketed that way, then the price may be good but just for this purpose only. As for a regular, whitening soap like other kojics, I might just give this a try once. ^hi, btw I don't know what MLM stands for. Yes, you can try this. yes it is superbrand but it is not a reason to have a Php 180/pc... It is overpriced...There are lots of superbrand products in the philippines which are cheap such as avon, sunsilk, colgate, etc. I think you have to search what "superbrand" means. Hi! same rin tau ng experience sa royale kojic soap. Unlike sa mga kakilala ko, effective sa kanila pero sakn, naglabasan talaga ang mga whiteheads ko sa mukha and hindi ko gusto yun. Ang pangit talagang tignan. Pero effective naman xa sa mga pimples ko sa back and chest. I will try na lng ang sinasabi mong kojie san para sa face ko. Cguro, same ang skin type natin. Anyways, thank you for the info! Also, thank you for this blog! the best! @Anonymous- Thanks for sharing your story. Well, we have different skin types and need so it's so true that what works for me may not work for you. So if ever 1 week na then you still feel uncomfortable with the soap you're using, you need to stop it na. It's a sign na di ka hiyang sa product. effective po ba? at ilang months po bago makita ang result? at pwede po ba sa teenager? 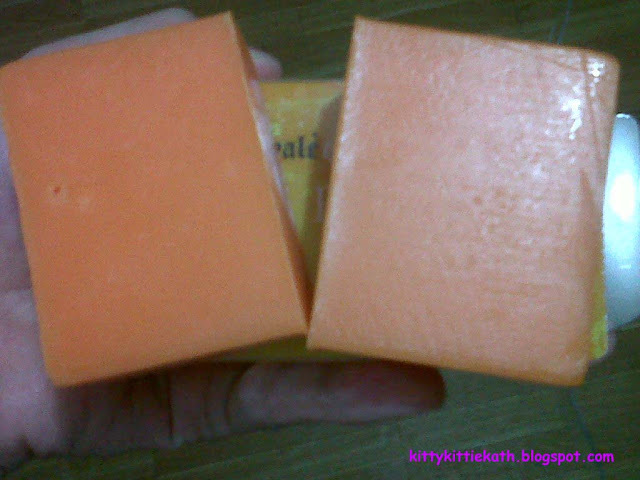 my royale beauty kojic and papaya soap ba sa watson? and pwede b gmitin un during day? @Lovy Castillo- I'm not sure if it's available now at Watsons. My SIL gave this soap a year ago and she got this from Royale mismo. About the usage, it can be used in the morning basta be sure to use sunblock with high SPF lalo na if you'll be staying outside. Pekas or freckles naman is hindi talaga maiiwasan IMO lalo na kung lagi ka nasa arawan and hindi nag-aaply or reapply ng sunblock kahit anong klase pa ng soap gamit natin. @jovelyn misa- hello there :D thank you for reading my review. interesting lahat ng question mo and you're using this soap na for 3 weeks. based on my experience, you can see the effects of whitening soaps after a month that is kung medium yung skin tone mo. unlike mine na fair to begin with minsan after a month ko pa lang nakikita. With regards to kojic soaps naman, 3 weeks is ok to see the effect kasi isa yan sa mga mabilis na magpaputi. pero may kasama din kasi side effects yung whitening soap like it can darken your skin if hindi ka gumagamit ng sunblock everyday kahit nasa bahay lang. you need sunblock lalo na outdoors na may mataas na spf kasi nakakasunog ang kojic in the long run. if you really want to whiten using whitening soaps kahit ano pa yun, kailangan talaga patience kasi it takes time and it's not a miracle to whiten skin overnight. kahit yung umiinom ng mga whitening capsules and nagpapa-inject hindi naman pumuputi agad in an instant. hope this helps, medyo mahaba yung answer ko. Hello everyone am just in search for a whitening soap and ive been reading a lot about ingredients used in whitening soaps. Just be aware that most of these soaps contain chemicals which leads to cancer. I've researched on this soap and it contains Cocamide DEA. Am not trying to scare anyone but dnt ruin your health just for the sake of looking good! Just be careful peeps!Thnx! @Anonymous- Thank you for sharing. Every product has its pros and cons same as the word hiyang and not hiyang. @Anonymous- thank you for sharing your experience with Royale, it's nice to know that your skin fared well with the soap but we have different skin types and needs. Not all are lucky na maging hiyang sa kanila yung product na 1st time pa lang na try. We cannot generalize that a product will give the maximum result to every individual. @Anonymous- Hello :) Kojie sn, Cyleina and Snoe worked for me. Try kojie san first, if medyo mahapdi sa face switch to cyleina kojic then Snoe Special Kojic and Gluta will do. hi ate kath. I'm male po. 17 years old at since bakasyon, bumili po ako ng kojic royale beauty dahil marami po ako nababasa sa net na positive results sa paggamit nito. 1 week na po ngaun simula nung tinry ko sya. pero napansin ko po na sa halip na bawasan eh parang pinalabas nya pa po ung ibang pimples ko tas nung pang 6th and seventh day ko na syang ginagamit, parang nararamdaman ko na nangangati po ung mukha ko.ung tipong ayaw ko mang hawakan ung mukha ko dahil baka madumi ung kamay ko eh hindi ko maiwasang kamutin ung mukha ko dahil sa kati.. dapat ko na po ba itigil ang paggamit nito? your reply will be so much appreciated..thankyou. hello po ate Kath. just wanna ask kung paano niyo malalaman kung "hiyang" niyo yung royale kojic papaya soap o hindi? your answer will be very much appreciated. @Anonymous- actually it all depends pa din sa skin type natin. if you have sensitive skin siguro after 2 days kung mahapdi or may burning sensation talaga better stop. Kojic acid kasi is medyo matapang talaga in terms of whitening. If I'll compare this type of whitening/lightening soap sa lahat ng na try ko na, kojic talaga mabilis makaputi kaya lang nga masyado matapang. Ang gauge ko kasi in terms of purging stage is if after 1 week ganun pa din it only means di ako hiyang. Some said 2 weeks while others said 1 month. But IMO masyado ng matagal ang 1 month na purging stage. kaya din po ba nitong paputiin yung mga unseen areas gaya ng bikini areas?tsaka nakakatanggal po ba ito ng blemish sa katawan? @Anonymous- hi, for your question I'm not sure though. Di ko kasi na try na gamitin yung soap sa sensitive parts ng body. But I suggest na wag na kasi medyo matapang ang kojic and I know may soaps talaga na para dun. Sa body naman, haven't seen any changes na naglighten talaga blemishes. Hi po. I'm male po. I've been using the kojic papaya soap for 1 month and 13 days. Nung umabot ako ng 3 weeks, mdjo nakita ko na ang effect pero ngayon parang napansin ko umiitim nanaman ako. Di naman ako pabaya sa sunblock pag umaga. But I read an article that sweating daw can cause dark skin, Na alala ko bigla na araw2 ako nag e exercise. Yon kaya 'yong reason? Salamat! @Anonymous- hello thanks for sharing your experience with this product. About the sunblock, do you re-apply it every 2 or 4 hours? The number of spf kasi sa sunblock tells you how long you'll be protected from harmful sunrays. Kaya dapat you look for high spf then about sweating, it can lessen the effect of sunblock kaya advisable din na pag pinawisan ka, apply ulit ng sunblock. How long and what time do you stay outside the house pag morning? Avoid sun exposure from 10-4pm lalo na ngayong summer. I haven't read an article na nakaka itim ng skin pag napawisan ka. almost all people perspire kahit yung mga mapuputi pero hindi naman sila umiitim. Kojic soaps kasi can also cause us to darken din kapag hindi maayos pag lagay ng sunblock. If you read one comment here, she said na matagal na sya gumagamit ng kojic soap then one morning nakalimutan nya magsunblock, umitim sya. So whitening kahit ano pa type ng soap yan needs extra caution na maarawan and kahit indoor light meron din effect sa skin. Miss Kath, nakalimutan ko sabihin na pag lalabas lang ako ng bahay 'yong dermplus na 35 spf gamit ko. pero madalas ako nasa loob ng bahay e at 5.00-5.30 na lumalabas, yong gamit ko na protection kahit indoor lang ako ay yong nivea men body whitening lotion kasi may effect na (Protects the skin from UV rays, which cause skin darkening). Did I use the wrong product? About naman po dun sa sweat na can cause dark skin, di pa naman talaga xa approved pero yong sa may ma singit lang daw sigurado, kasi dun madalas pinapawisan. Tama yong sinabi mo miss kath. palagay ko maitim ako pero yong iba sabi nila pumuti raw ako. Binibiro na nga ako na para na daw akong bading kasi pumuti nga. hehehe. d ko naman kasi feel pag tumitingin ako sa salamin. Pero kanina lang bumili ako ng sunblock, ung SPF 80 na for better protection kulang talaga ung SPF 35. Pwede siguro pang indoor ung SPF 35. Hi! is kojie san really effective in whitening the skin?? the one with the japanese made?? @Anonymous- Hi, yes Kojie san is effective for me but for some time na immune yung skin ko. Since I'm fair already, wala na ko ma notice na change. IMO, all kojic soaps really lighten the skin to some extent na sa iba it's obvious sa iba naman is hindi. hi kath! i tried likas, kojie san and royale beauty kojic and papaya soap but i find it too harsh for my skin. i get dry skin after every bath aside from the sting at the corner of my mouth. good thing i got this generic soap, a combination of kojic-gluta from my friend. 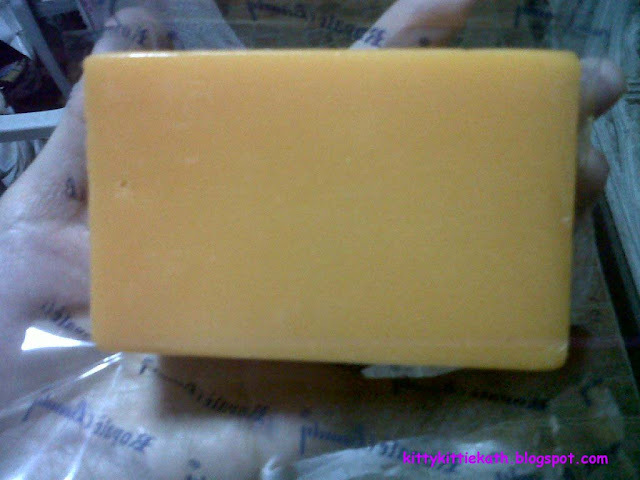 its an organic soap which and have a micro-peeling effect, doesnt sting, mildly-scented and cheap too at 135g for php65. anyone interested can txt me with this #09272945152. @CJ Escuadro- hello, yup effective talaga kojic soap for whitening kaya lang in my case naiimune ako in the long run. I'm using the Kojie San also the anti-aging soap the white one & I tried the orange too but I don't like the stinging of my skin..yes this one is pricey..
@Sherry Ann- oh, I guess you're using a high end glutathione soap eh? 200+ soaps are very expensive for my budget dear. Thanks for sharing. Want to try this, hope it works for me. im using Kojie San for me its effective kc d nmn pare pareho ang skin type kya dapat hiyang din sau ung ggamitan un nga lng it melt so fast.i will try this soon. @marsha- yup Kojie san is effective pero in my case na immune yung skin ko. sadly, most kojic soaps that I've tried melts faster then the soaps with harderner. @janice- hope this soap will work on you! @Rica- yup, try it and let me know if effective sayo :) Good luck! @Anonymous- yup, kojie san is available in all leading supermarkets and department stores nationwide (Philippines). @magzdc- hello :) what kind of soap you usually use? Same here, the price for me is another factor to consider. @Jenny Cos- thanks dear. I hope you can help my readers especially you sell kojic soaps pala. hai .kat ask q lang panu pang hnd ka gumagamit ng sunblock wala bang effect nas puputi ka kahit gumagmit ka ng kojic soap??? @anonymous- you need to use sunblock talaga kung lagi ka nasa labas ng bahay kahit hindi kojic soap gamit mo. kasi whitening products tend to make skin more susceptible to sun's damaging rays. Lalo na pag kojic soap, i heard some individuals who uses kojic soap na umitim kasi nabilad sa araw and hindi sila gumamit ng right spf of sunblock. So it's better safe than never diba? @Pretie Via- How long mo na ginagamit yung soap. There's a purging stage kasi na tinatawag especially if bago ka lang gumamit ng soap. It's like nilalabas yung mga deep seated dirt sa face like pimple, whiteheads, blackeheads para ma clean yung pores. Pero pag matagal na yung pimple syo, let's say 2 weeks it only means di ka hiyang. Im 16 Years old, hmm. 4days ko na po ginagamit yung Kojic, Bgla po akong nilabasan ng pimples. pero pumuputi naman po yng mukha ko. what does it mean? should i stop using or not? Thanks. @helen gatbonton- yes it's effective, madami na nagsabi pero sad to say sa akin kasi hindi masyado. it works by lightening the pimple marks. @anonymous- it's called purging stage. If you just started using the product by now, ma eexperience mo talaga yan. Since you're 16 pa lang, medyo affected din ng hormones yung pag labas ng pimple mo. I cant say na dapat itigil mo na kasi it's 4 days pa lang. give it a week and pag mas lalong dumami instead na mag dry, it can be na hindi ka hiyang sa product. Hellow gumamit na ko dati ng royale kojic nun nsa laguna ako at spf24 lang gamit pero pumuti talaga ako...kc gnmit ko talaga xa sa tuhod ko at yun maganda talaga..kaso natigl nun umuwi ako ng quezon province...Ate KATH tatanung ko lang po available na kya royale kojic sa sm lucena.sa watson..
@handara- I'm happy na maganda result syo ng Royale. Ang alam ko meron na din sa Watsons nito kasi nakakita ako dito sa watsons Manila. I used Kojie San,mas mura sya compared sa Royale Soap,ang yes it lightens my skin in just 2 weeks of using,ang problema lang madali syang matunaw,well its just my opinion.hihi,natawa naman ako sa smells like PERLA. @elsie valdez- yup for me it smells like perla. I used kojie san din before and it's effective for me. Hello Guys, If I were you, use BEAUCHE instead..
very effective pa and best for all skin types..
hindi namimili ng skin type..
Hi mis kath... Ask ko lang po kung pwede po ba ipagsabay ang kojic papaya and glutha soap s face? And paano po? Hi ms kath.... Ask ko lang po kung pwede ipagsabay na gamitin ang kojic papaya and glutha soap? And paano po? Thank u and god bless..
@Anonymous- thanks for sharing your insight about the product. Since we all have different skin care needs and budget some may find this cost effective while some may find it expensive. @Anonymous- nag continue pa ba yung mga pimple mo? meron kasi tinatawag na purging stage usually 5 to 7 days yun peropag hindi pa din nawala it means di ka hiyang sa soap. @Minelyn Lozano- if masyado matapang yung kojic sa face mo i suggest wag mo pag sabayin. pede kojic sa morning, gluta sa evening or vice versa pero pag hindi naman, pede mo pagsabayin. unahin mo kojic then after 2 minutes yung gluta naman pero wag mo ibabad ng matagal. @Rhea Juaton- usually one month pag fair skinned na then sa iba three months. kojic san user din ako..noon dmi ko talaga pimples sa likod ko but whn i used the soap for my daily bath nawala xa..hindi na din masyado dmi pimples sa mukha ko..but this few days nag try din ako ng royale kojic papaya..will my effect nmn xa..sabi ng mga friend ko.pero takot ako baka sa susunod na araw bka lalo akong umitim kc hindi ako gumamit ng sunblck always pa nmn ako lumabas..
kojic san user din ako..dmi ko pimples sa likod noon..din nag used ako sa soap nato im happy talaga kc nawala talaga.pati pimples sa mkha ko nging natural nalng..but dis few days ngtry ako ng royale hindi ba ito maka sira lalo sa skin ko na papalipatlipat ng gmit?effective nmn xa pero bka umitim ako lalo kc lumalabas ako everdy walang gmit na sunblock..
@anonymous- hindi makakasira sa skin kahit papalitpalit as long as effective syo yung soap. Always use sunblock kasi pede ka umitim ulit. I've tried this, kinda hard to find nga lang pero meron sa watsons I reckon. Maganda sya in fairness and the effect are showing in weeks time. Want to try it for hubby, i hope effective na sya sa kanya kasi yong ibang soap nangangati daw mukha nya. @Anonymous- thanks for sharing your experience and posting resellers. It will be helpful para sa mga gusto mag try ng soap. @gwenny- thank you so much for sharing the effects of Royale. You still need to use sunblock kahit hindi ka naaarawan kasi yung indoor lights may effect din sa skin natin. spf 25 will do. As of the moment, I can recommend Nivea kasi it's one of the cheaper sunblock available in the market today. @myril mae- thanks for sharing, I also saw this at Watsons, they're selling na ng Royale soap. @lynee ayuban- na immune na yung skin mo sa soap so need to look for a new soap na. @Belinda Ibanez- hope this will be effective for your hubby :) good luck! I have this soap pero diko pa ginagamit kasi i am currently using kohie san. thanks for this review and andaming comments and feedbacks about this soap, it really helps a lot . I already tried this soap before, and its really a good one though its pricey. I am a fan of kojic soaps, dun talaga ako nakakita ng magandang improvement. How I wish they lower their prices. @Leilani Gamboa- I see, yup ang dami na kasi naka discover ng soap na to. It depends pa din sa skin, hiyangan lang din. @smsaguin- wow, thanks for sharing your experience :) the l-gluta soap looks promising din kaya lang di pa ko maka try ng ibang soap dahil ang dami ko pa soaps na need i review. @Jo-an Victorio- thank you so much for sharing your experience. About naman sa price medyo pricey compared sa competition pero according to the effects naman kung effective why not spend a fortune diba? Kojie San is a nice soap, but there are many fake products in the market. Can you please help us identify original from the fake ones? @Pauline Reyes- yes sis, it's a nice soap. My apologies because I haven't seen a fake Royale soap and this one came from the direct sellers. So I guess the issue of counterfeit doesn't exists with this brand. @Mary Karrene Gonzales- Thank for sharing your experiences. I'm happy that you love the soap and I think is giving positive effects on your skin. @Stephanie Muniz- thanks for sharing your info dear. A big help to those who want to try Royale products. @Stephanie Muniz- thank you so much for dropping by! im an royale independent distributor, juat check my facebook for more products of royale it mari khar neri..
Hi nakakaitim po ba ang singaw ng araw hindi naman po ako naaarawan pero naiinitan ako sa singaw ang init kasi sa bahay eh walang hangin nakakaitim po ba kasi 2weeks nakong nagkokojic pero parang walang nangyayari? Nakakaitim po ba ang hangin kapag mainit? Yung singaw po ba ng araw nakakainit din? @Chen Samson and Darlene Alvez- thanks for visiting my blog. I'm not 100% sure but in my experience it's YES! Mabilis ako umiitim sa singaw or sa hangin lalo na pag mainit. About sa Kojic, 2 weeks is not enough to para makita yung results. Minsan nasa skin composition din. If moreno/morena ka matagal pumuti lalo na kung lagi ka nag-papaaraw. Hello Ate kath. Im a male. I just want only to ask if this product is really effective in removing acne and suitable to teenagers like me, because I'm only 15 years old. I'm just curious because I have just read at this blog about your products which stated that it removes acne and whitens your skin. Also I want to ask if how long it would take to lighten or remove the scars and dark spot which is currently on my face. And can you explain to me what really "hiyang" means in terms of using products.Hoping I'll get an answer. Thank you. Hello Ate Kath. I just want only to ask if this product is really effective in removing acne and suitable to teenagers like me, because I'm only 15 years old. I'm just curious because I have just read this blog about your products which stated that it can remove acne and whitens scars. Also I want to ask if how long it would take to lighten or remove the scars and dark spots which is currently in my face?Hoping for your answer. Thank you! Yung Singaw po ba ng araw nakakaitim po ba? Kahit hindi naaarawan yung baLat ko mainit kasi dito sa bahay eh? Nakakaitim po ba ang mainit na singaw na araw? Yung mainit na hangin? Hello dear :) In my experience YES. Mabilis ako umitim sa singaw ng araw and mainit na hangin pero bumabalik din naman with the right kind of skin care products and yung skin tone ko kasi fair ako with freckles kaya madami masunog balat ko. Hi Bryan, how long have you been using the soap? If ever more than 3 weeks na and ganyan pa din it means hindi ka hiyang. Is this your first time using a Kojic soap? Minsan kasi on the first 3-5 days makati yung kojic sa face meron talagang stinging sensation pero kung parang nasususnog na hindi na maganda yun. Also, use a high spf sunblock everyday lalo na if your using kojic acid kasi mas susceptible ka sa sunburn. Thank You. Ate Kath Rivera. .. As of now wala na q ni isang pimples because I used the Defensil soap of Kojie San. It totally removes my pimples in just 1 week. But still thank you pa rn sa info. and pgsagot sa question q. More power! Your welcome! I'm glad wala ka ng pimples :) And thank you rin for sharing your insight about Defensil naman so that readers who are looking for an anti-pimple product will have another option. I want to try it...di ko pa to nasusubukan! Try it dear and let me know if this works for you! I dont like papaya to eat but i have heard that papaya soap/scrub and cleaner are gud to exfoliate !! Me too! I don't eat the ripe papaya fruit. Yes, this fruit is very good for the skin. Oh wow, what a luxurious bar of soap. This looks amazing! And nice texture. For some this soap is amazing, it's nice to others. Yes, it's good for the skin but remember to wear sunblock if you're using this. Hi! I'm using kojie san kojic soap and it is effective. Yun nga lang, my face is quite whiter than my neck so now I'm using it more often on my body. Another thing is nagpipeel din yung skin ko and parang dry pero nawawala din naman.. Aside from kojic soap, I'm also using dove soap and clean & clear deep action cleanser on my face. What other soap/ product po you can recommend that are effective in whitening, moisturizing skin, controlling oil and also good in removing pimples that can be bought easily? i havent used the product yet but i have a question. if im using it for a year or so or if i see differences can i just stop using it? since u said it would make ur face really white. i dont want a really white skin i just want to get rid of my pimples and black spots. Yes I guess, that's what happened to me with other whitening soaps that I'm using. My face would look whiter than the rest of my body. I suggest you use a soap especially formulated to get rid of pimples and a spot treatment for the dark marks. Hello, thank you for asking. Kaya lang I'll not be able to advise you kasi hindi ko pa nagamit yung soap na yan. Magkaiba sila ng Royale Kojic Papaya soap. hello ms.kath,my mom uses this soap,but where po can we buy kojic soap that is effective and original? Hhi ate kath ask ko lng po ang gamit kopo ay kojie san lightining soap. Ilang months po ba pra mkita ang result ? Morena pk kc ako eh. Gusto ko lng po mlaman kung ilang months bgo ang resulta ng kojie san . Effective rin po ba un sa pampaputi . ?? Hello, I'm not sure about kojie san. matagal ko na kasi nagamit yun ang I'm not sure of the effects now e. My review is Royale Kojic Papaya soap so I can give advise lang sa effects nito not on Kojie San. Pasensya na. 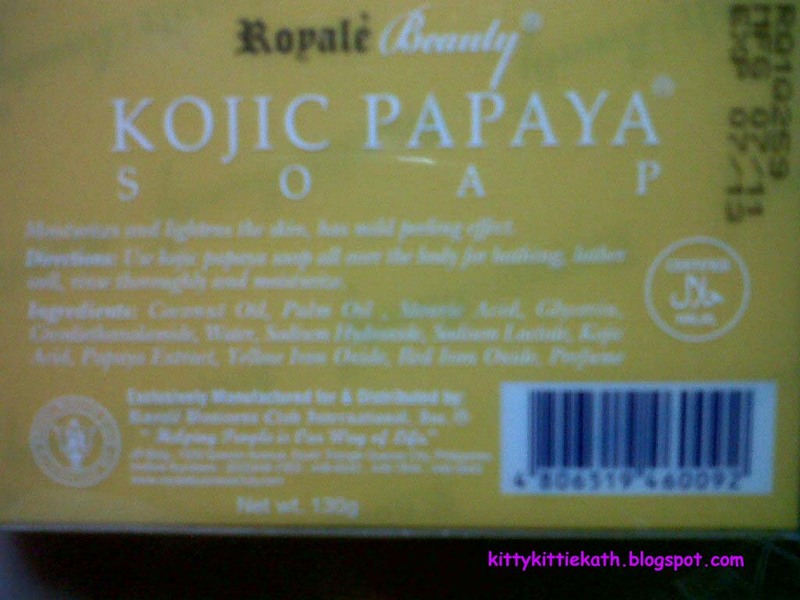 Hello, my review po is ROYALE KOJIC PAPAYA SOAP NOT KOJIE SAN. I cannot give you an idea between original and fake Kojie San because I'm not using that soap. Thank you for sharing your experience :) Hope those using this soap will see the effects too as early as 1 week. How long have you been using this soap? You need to use sunblock lalo na pag gumagamit ng kojic soap and lagi nag papa-araw. I'm not sure about the l-gluta power lotion kasi I haven't tried it pa eh. For how long na dear and Royale ba yung gamit mo? Hi po Ms. Kath.. im currently using Royale kojic for almost 1 month na.. dumami kasi ang pimples ko. pa advise lng po sana ako if normal lng ito at e continue lng ang pag gamit. salamat po. Hello, try to stop muna kasi 1 month na yung pimples mo? Minsan normal sa iba minsan hindi. Pero pag lagpas one month na and may pimples pa din it means hindi ka hiyang sa soap. Avid user of Papaya and Kojic Soap. You really have to maintain using it though. I've been a kojic soap user for years already and hindi ko pa natry and royal product because its pricey. thanks for the review, it gave me an idea about their product.